This piece measures slightly over 8 inches. It is has a brass loop for hanging. 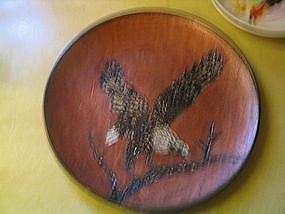 I've never seen a plate like this, so I don't know if it came from the manufacturer with the eagle and background painted on, or if someone did this after the purchase of the plate. There are no identifying marks or labels to indicate where it is from or who manufactured this plate. There is a certain amount of roughness in areas, but it does not appear to be damage, but rather the texture of the plate which was painted over. There may or may not be wear to the painted rim because it could just be the way it was applied. I will be happy to get additional photos to show what I'm talking about. If you have questions regarding this item, please email.